Drop forged from high carbon steel and scientifically heat - treated to give tough body (45-48HRc). The cutting edges are induction hardened after individually matching to give high hardness of 55 / 60 HRC which does not get damaged even while cutting hard wires. The rivet is made from carbon steel, prevents play even after considerable long use. The cutting edges are sharp and precision machined to appropriate angle to cut thick and thin wires neatly and with ease. Minimum load value is much higher than average pliers. Normally no human being can apply so much load. Insulation Sleeves made from quality CA Plastics are long lasting and will not break or crack even if it falls from height and also ensures safe electrical working. Insulation Tested up to 4000 V DC or 2800 V AC. Sleeves are thicker for comfortable grip. Dimensions : 17.4 x 7.2 x 1.4 cm. 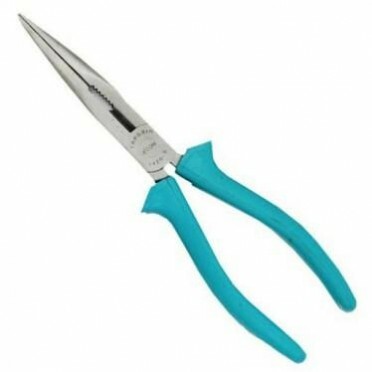 Features & Specifications :Keep this pair of Taparia pliers and perform electrical repair, gener.. Features :Drop forged and differentially hardened and tempered. Cutting edges are sharp an.. Description :10 Piece Set (1/16",5/64",3/32",1/8",5/32",3/16",7/32",1/4",5/16"&3/8")Accurately H..
Taparia Wire Stripping Plier 6"
Features & Specification :Made from high grade steelAvailable in 5-inch and 6-inch sizes and use.. Features :The pipe wrench is an adjustable wrench used for turning soft iron pipes and fittings .. Features :The rivet is hardened and made from carbon steel, prevents play even after considerable lo..